I love my garden. It makes me happy to grow flowers that I can cut and bring into the house or just share with others. These are photos from my cottage garden. My stunning peonies. These are the first peonies that I purchased. I've had these for about 16 years. They have a glorious scent of old fashioned roses. So pretty with a light rain falling. I took better photos yesterday and lost them all....don't ask. These white iris are dainty and elegant. They were given to me by my friends mother, who is now with the Lord. The delightful thing about gardens and gardeners is the generosity of sharing beauty by dividing perennials. It's a joy. A flower head on my hydrangea. I cannot wait - I look forward to these beauties every year! I wanted to show you my new pots on the deck. Euphorbia Diamond Frost, Calliope Dark Red Geranium, and Margarita Sweet Potato vine. In the matching pot, I used Sweet Caroline Sweet Potato vine. We are thankful for those who gave their lives in the service of their country. What does a poor cowpoke do when he finds himself uprooted from his native Texas and livin' nearly in the East??? 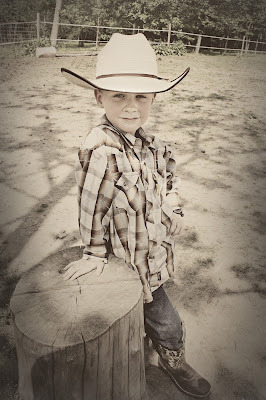 Why his Momma throws him the best cowboy party ever! Luckily, the birthday boy's older brother and sister take riding lessons from Lindsay and so it was easily arranged for this cowpoke to come ride, and have his party here. We offered a campfire for roasting hotdogs, and his Momma brought beans, chips, and s'mores too! This has been a rough week for his Momma Amy, but as everything was already planned and organized, and this was the only day off for his Daddy for many weeks, it was decided to carry on! 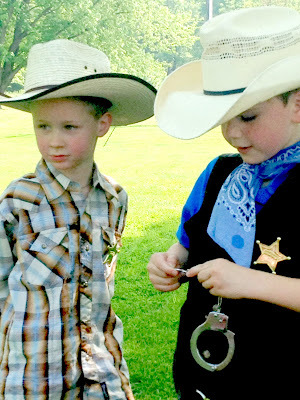 Yesterday we hosted a Cowboy birthday party for a friend. He's turning FIVE! Here are a few photos of his party. His Momma is a clever gal and she did all kinds of neat touches with his theme! Lindsay has better photos than I do and I'll show you some of those tomorrow. In the meantime, enjoy the first peony to bloom in my garden this year! Psalm 139:16 - Your eyes saw my substance, being yet unformed. And in Your book they all were written, The days fashioned for me, When as yet there were none of them. Thank you for praying for my precious friend Amy. It was a horrific miscarriage - we nearly lost her. We did lose her baby boy Noah John. God's ways are higher than ours and sometimes to us mysterious, because we don't understand. However, sometimes He shows us glimpses of His hand at work. Amy was lobbying her family for the name Ezra, if the baby was a boy. They all shot her down - they wanted the name Amy's husband suggested, which was Noah. My precious friend, Amy, suffered a miscarriage today. Would you please pray for her to heal well physically and emotionally as well? One of the things I've struggled with in owning our business is the time it takes away from me being able to home keep. For me the ability to rearrange furniture, clean the wood furniture, sew, bake bread etc, are avital part of keeping home. One that I miss very much. Today I got to do it. I made bread, and I made muffins for breakfast on Saturday morning. The recipe is here. It was all delicious and a way to meet the needs of my family! I am in the mood for a nice chat today. I am drinking a nice glass of iced tea, and watching my granddaughter Kamryn this morning. I love this little girlie and I don't get to spend much one on one time with her - there are usually lots of aunties and an uncle who she loves to play with. They are not here this morning because they are helping my Dad place flags on the graves of veterans in preparation for Memorial Day. We have finished our required days for school and are finish our science book and doing a bit of math, and of course we are always reading. Emma is now the proud owner of a Honda Civic. It is a very nice used car, and she, of course is loving it! I am very proud of all my kids. I am a very blessed woman. I have been researching and plotting out my trip to England and Scotland. I am thrilled to have the chance to go. I must get my passport! It's so great that my first stamps in it will be from Britain. Today, I am late to the party. I am enjoying our long cool spring. 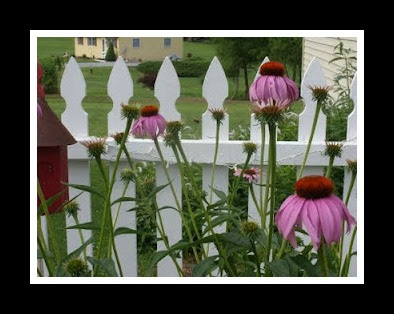 I am hopeful that the rain will bring beautiful cottage flowers in the summer. Meanwhile I'll enjoy the photos of last years garden. Link up if you want to share some photos that you think would make nice notecards.